The lovely team who look after the Rachel Kay Shuttleworth collection at Gawthorpe Hall are such an innovative bunch. 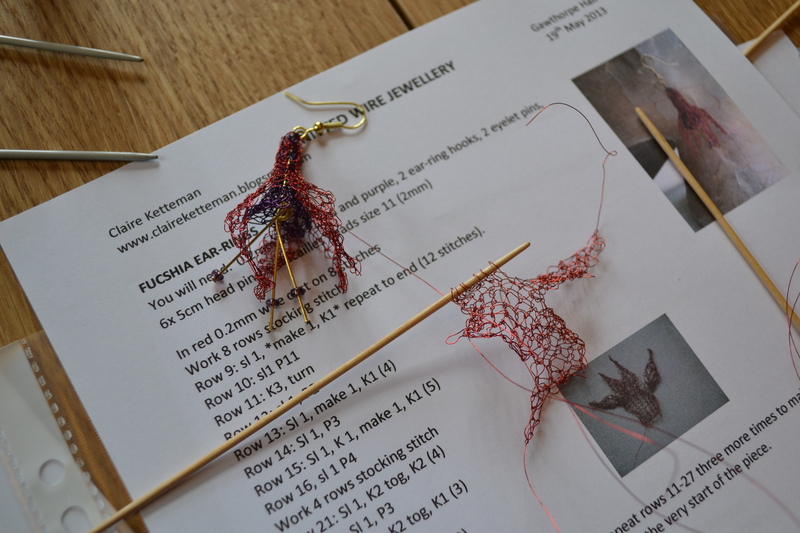 Not only do they hold inspiring workshops and textile study days, they have cunning plan to use the historic collections to inspire new designs for knitting and crotchet patterns. Those if us who know our museum history will be aware that this is a role for museums that the Victorians firmly believed in. How many museum studies students have written essays about the founding role of the South Kensington Museum, later the Victoria and Albert, to inspire British designers? Last Thursday I was able to join a small group of designers as they pored over a wonderful selection of treasures from the museum collection. They included Debbie Bliss who turned out to have a quietly wicked sense of humour and Kate Davies who writes one of my favourite blogs, Claire Montgomerie and Emma Varnam, who encouraged me to start this blog. I can’t wait to see the designs that materialise from the Gawthorpe inspiration. Their plan is to sell the new patterns and to have them displayed – with the historic examples which inspired them – in the gallery. It will be fascinating to see how the designers reinterpret the knitted and crocheted treasures of Gawthorpe for today. Shown here is a tiny selection from the many examples the curators had set out for us to study. Image courtesy of Gawthorpe Textile Collection. Not to be reproduced without permission. 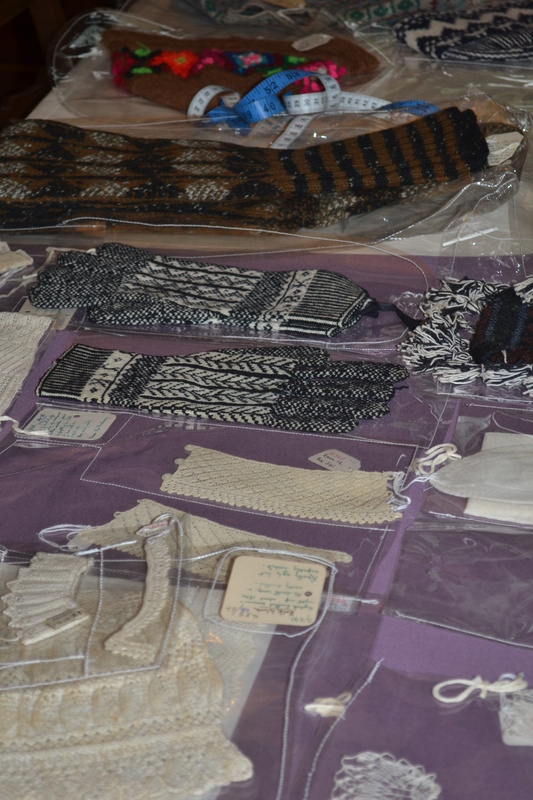 The Gawthorpe Textiles collection is one of the heritage gems of the North West of England. It deserves to be better known. Fabulous embroidery, quilts, lace and costume. The collection is housed at Gawthorpe Hall, a lovely JacobeanNational Trust property in Padiham, not far from Burnley. This year they are running a series of artist-led workshops. Eager to try something new I spent a very pleasant Sunday afternoon at a knitted wire jewellery workshop. 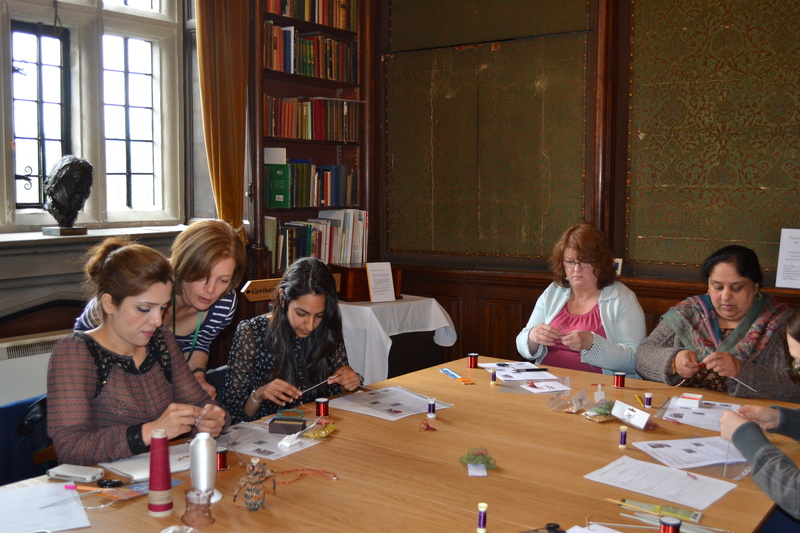 The workshops are held in the lovely library which was very tantalising as there were so many enticing textile history lining the room. However there wasn’t time to browse as we had a project to complete during the afternoon. The workshop was led by textile artist Claire Ketteman who inspired us by showing some head-dresses she had made for dance performances. Check out her lovely blog, Textile Alchemy. The earring hooks, wires and beads were provided and Claire helped those of us who were new to jewellery making put the earrings together. They dangle just like real fuchsia flower heads do. You can see a perfect example on Claire’s blog. 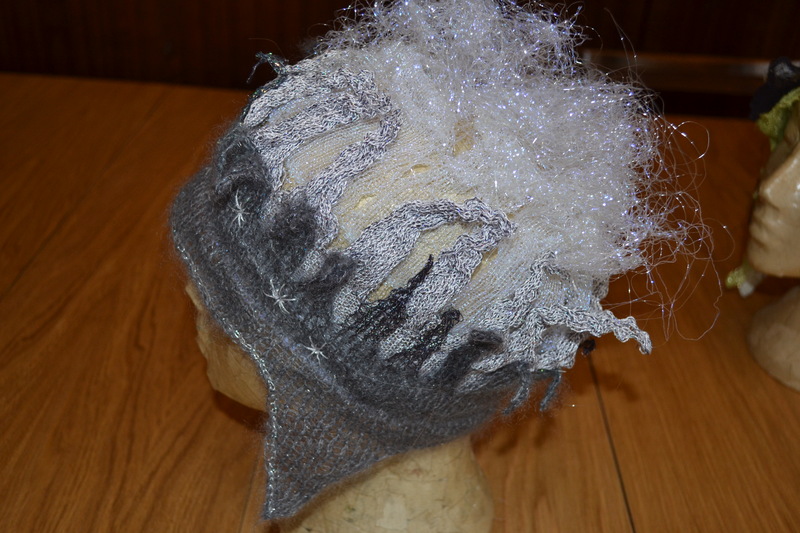 I haven’t been to many knitting workshops – a couple at Rowan in Holmfirth – and this one. But when I do I always wonder why I don’t do it more often. There is something about sitting round a big table with needles and yarn that is very conducive to amiable chatter. As well as workshops the Gawthorpe programme also includes ‘Exploration Days’ with opportunities to look closer at parts of the collection with a curator. Sessions on lace, quilts and embroidery are coming up this summer – I’m sure they’ll be a real treat for historic textile enthusiasts.